Solitary. I love capturing a person in a quiet and often unexpected moment. These kinds of images can be reflective, mysterious, or even sad, conjuring strong emotions and stirring up stories in my head. 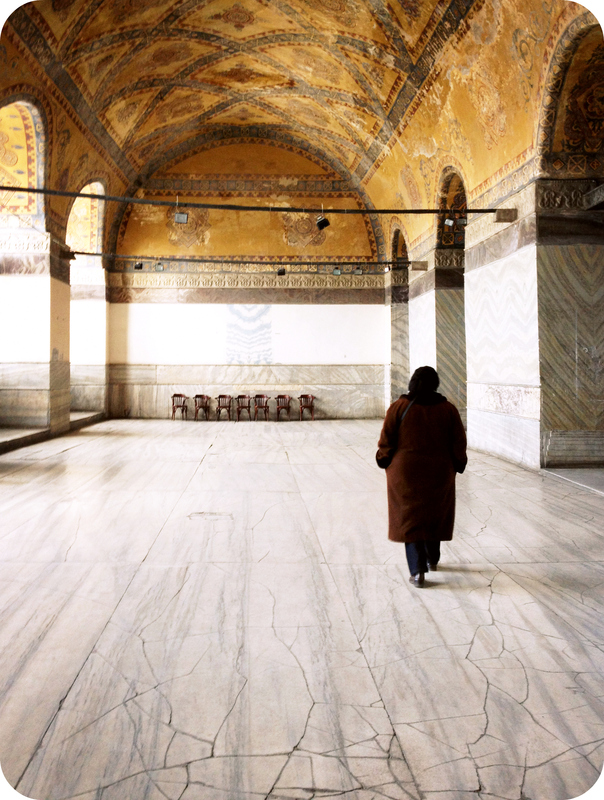 I snapped this photograph in the grand Hagia Sophia in Istanbul, Turkey. That afternoon, it was very busy and crowded inside, but I turned a corner at one point and walked into the empty, bright, airy space pictured above. I experienced a few moments of silence as I watched a woman walk to the end of the room. We were strangers—yet alone, together. A solitary moment, frozen with my lens. Share a picture that means SOLITARY to you! This is a good challenge! I don’t do the Weekly Photo Challenges, but I just might have to get involved in this one. Love this week’s challenge! Thank you! Perfect for our mental health photography collective. Almost all of the photos we ever post would work, especially what we have been posting this week!! Lovely theme and an evocative shot Cheri! solitary camel standing tall in the Saudi desert. Here’s mine from a kayak trip in Alaska earlier this year. This was not what I expected to do. I figured I would find a solitary person… Not a solitary source of energy! LOL! Cool challenge. Posted a few of my own of the sea, me, a man on a train, and a ball. Many of our recent posts would work so perfectly this week, but here is a new one posted especially for the challenge! Hope people will visit some of the others if they get a minute. This one is about solitude, masks, and depression. 276 Responses While this challenge is closed to new entries, we encourage you to visit the Reader to find other avid bloggers. Spinster's Compass Weekly Photo Challenge: Solitary. Gerry's Space. Challenges-Solitary and People. Flying South for the Winter Solitary confinement? Paris en photographies Il y en a tant de gens, mais il s’agit quand même de la solitude. the unbearable lightness of being me. Weekly Photo Challenge: Solitary.